Question: I play baseball and have only a few more weeks of fall ball before our off season. I wanted to know what exercises you thought were the more productive for improving throwing speed and bat speed? Answer: Randy Hadley, a good friend and amazing trainer in Orlando, who’s client list includes MLB players and several top ten draft picks, shared his insight on this. Too many kids and their parents think that the only way that they are going to get scouted is to play baseball ten months or more each year. Few have the courage to defy the current system by choosing when to play and how much to play. They mostly fail to recognize that the scouts are looking for improving stats and stats are what get you the looks, not what teams you play for or how many tournaments you’re playing in. When do you take the time to improve your athleticism, strength and speed? Although you can face a variety of pitchers, you can’t improve your skills during a game. If you have a hole in your swing you can’t adjust it by facing game situations. It changes by drilling the constructive aspects of changing your swing. Likewise, building strength, speed, flexibility and explosive power come from a 12 to 16 week “off-season” and learning how to continue to build during the season. Baseball is a game of waiting, anticipation and explosive movement. Your body has to be finely tuned to be able to stand expectantly idle for periods of time and instantly explode into movement without injury. Core strength is essential for greater running speed, bat speed and improved power. Dumbbell Bicycle Crunches are highly effective and so are Farmers Walks with either one or two dumbbells. 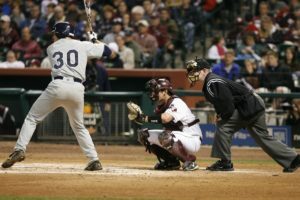 Powerful legs, lower back, glutes and hip flexors improve bat speed and pitching speed. With that in mind, use Single Leg Hip Presses, Single Leg Squats, Barbell Squats and our own Speed Board Squats. Windshield Wipers work hip rotation well along with Russian Twists. Deadlifts are great for simply becoming stronger. Compound shoulder exercises by combining High Pulley Rows with Dumbbell Side Latersls and Front Dumbbell Raises. Also, include Plyometrics, explosive jumps. These aren’t intended to be for time or part of a conditioning sequence as they are currently applied in some training systems. Use the off season for growth, repair and improvement. It will improve your abilities on the diamond.